Perfect Log Cabin Quilt Blocks: 2 secrets no one spills! 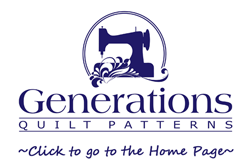 For Log Cabin quilt blocks, or any block for that matter, the general advice is cut, sew and press accurately. Not particularly helpful, and I'm sure not what Linda is looking for! Fortunately, there is some advice I can offer that you don't usually hear or read about. Simple changes that can make all the difference in the world to the accuracy of your finished blocks. That's what we're after, right?!! Blocks that go together like they were made for each other. ...the most impatient people on the planet. Always itchin' to see if our quilt top lived up to our creative expectations. These two 'secrets' are simple changes to the way you cut the logs and set up for sewing. Nothing more than that. An investment of maybe 5-10 extra minutes, and you're on your way to making accurate Log Cabin quilt blocks. You'll get those minutes back in spades when it comes time to set your blocks together. This is incredibly important for a block that has so many seams running left to right and top to bottom. In the block to the right, if each seam were off a mere 1/32" per each log, that means 1/16" per seam (two logs make up a seam). A wee bit that adds up to a lot! Multiply by the number of seams—8 (not counting the outside edge) times 1/16—and the block could be as much as 1/2" bigger or smaller. That's way too much fabric to try to ease into the next block or sashing strip. I prefer to use a 1/4" presser foot with a guide or flange along the right side—a physical barrier—and not just rely on sight using the standard 1/4" foot that came with my machine. Log Cabin quilt blocks mean lots of sewing. Not hard sewing. But a lot. Your mind can wander. You just plain get tired. Or bored. This foot, along with a healthy application of starch, makes for strips that ride right up next to the guide without collapsing against it. This combo compensates for those times when you have the undeniable urge to sew, but really, honestly are too tired to do your usual good job. Now, we can talk about a quarter inch versus a 'scant' quarter inch all day. The only thing that really matters is that it works, and works specifically for the fabric(s) and thread combination you are using for your current project. Elsewhere on this site I recommend to all my beginning quilters to 'do a sewing test' with 3 strips of fabric before every project. That'll do for a lot of beginning projects. For Log Cabin quilt blocks, we need to take this a bit further. Let's assume we're going to make the red and white block shown above. It is a total of 9 logs across including the center square. As I showed previously, very small mistakes add up during construction—1/32" off per log added up to 1/2" off each block! I used three different fabrics so it's a bit easier to see, but you could just as easily use only one. Set up your quarter inch on your sewing machine. Stitch the squares together end to end. Press, first with each seam closed to set it, melding the thread into the fibers of your fabric, and press then to the side. Now compare it to the 9-1/2" strip. If you can stitch the two strips together without having to ease one side to the other (below), you're ready to jump in and start making your blocks. If your sewn strip is longer than the cut one, your seam allowance is too small. If the sewn strip is shorter, your seam allowance is too big. Either way, you need to make adjustments and do the test again. Rinse and repeat until the two strips are equal. To save time on future projects, make note of this test. Keep this information at your sewing machine, handy for when you need it next time. If you are struggling with your perfect 1/4" seam allowance, you may want to try Perkins Dry Goods' Perfect Seam Guide (shown right). For our Log Cabin quilt blocks, that means you can't inadvertently stretch a strip as you sew to to the block. Most quilt patterns instruct you to cut cross grain strips and then subcut these into the required patches. That's OK for most shapes. For our Log Cabin, however, most of the stitching is done along the length of the patch. Having a lengthwise grain edge for stitching means you just can't stretch the patch while sewing it. This then leads right back to Secret #1. Your seam allowance must be spot on because you can't ease out the imperfections. Example: Log/patch that measures 1-1/2" x 9-1/2"
Old Way: Cut a cross grain strip (selvedge to selvedge) 1-1/2" wide. Sub cut a 9-1/2" patch. New Way: Cut a cross grain strip 9-1/2" wide. Sub cut a 1-1/2" wide patch. Yes, you did read that correctly. You're still cutting crossgrain strips, but cutting them the length of the patch, 9-1/2", and not the width of the patch, 1-1/2". 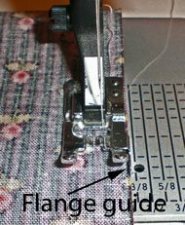 Cut a strip parallel to the selvedge that is the width of the patch, 1-1/2". Sub cut a 9-1/2" patch. Double check to see that you've got enough fabric for cutting this way. It SHOULD be close, but you don't want to run out two blocks from the end. If there are multiple sized patches cut from one fabric, cut the longest patch first, cutting as many as needed. Then subcut other patches from the remainder, making economical use of your fabric. One additional advantage to this method is that the designs printed on our fabrics tend to be straight on the lengthwise grain. On the crosswise grain...not so much. They're usually off-kilter. That's all there is to perfect Log Cabin quilt blocks! I promised simple and that they are! These techniques are based on ones used in garment construction. 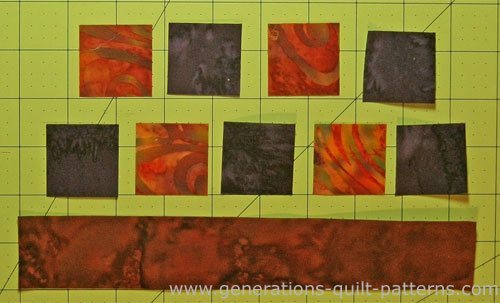 The best pressing secret that I regularly recommend in all my free quilt block patterns is, too. But there's not a lot of crossover between garment sewing and quilting. So you can imagine my surprise when I came across these books by Judy Martin (Seriously. She's a Quilting Goddess!). 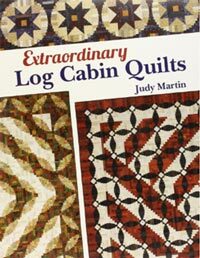 If you're inspired to take your Log Cabin quilting skills to the next level, please take a look at both these books by Judy. 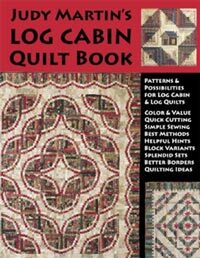 If you are partial to Log Cabin quilts, they are both a MUST in my book! Clicking on the images will take you right to Amazon.com where you can learn more. 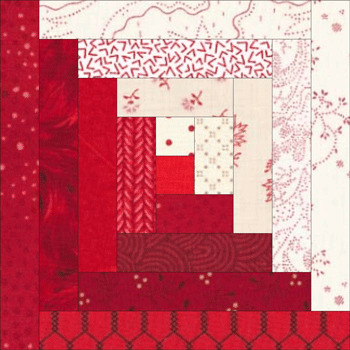 More Log Cabin quilt blocks to enjoy!